Last year, I purchased 'Barton Fink' on DVD. It actually sat on my shelf for many months before I picked up and decided to watch it. I'm not sure what took me so long to get around to it, I am a Huge Coen brothers fan, why did I not watch it instantly ? I finally saw the film,knowing basically nothing about it, and there have been few times in my film going life where I have sat in complete awe, lost for words like I was when the credits began to roll on this film, I was blown away, what a Masterpiece! Its been a while since that time but 'Barton Fink' is a film that still pops into my head every so often, as I reminisce about how amazing it was and how mysterious the climax scene is. 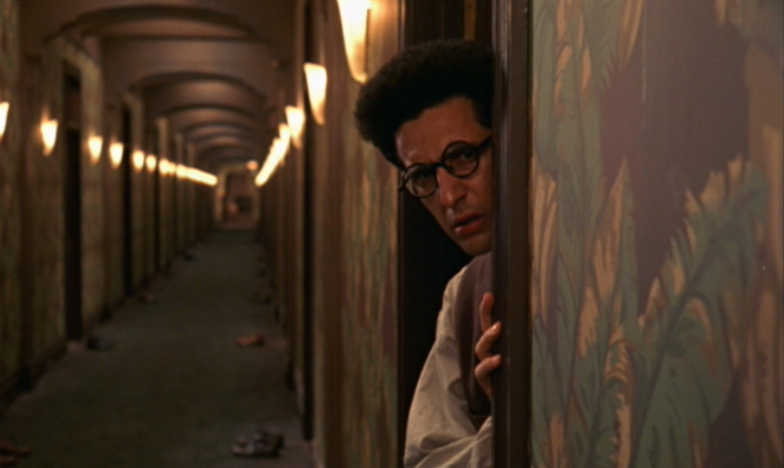 Today I rewatched 'Barton Fink', I think the reason it took me so long was because I really did not want to ruin that first time experience for myself, but never the less I put the DVD once again into my player...112 minutes later, I was blown away all over again. Barton Fink, is a successful New York Playwright who has gained the interest of a Hollywood big shot at Capitol Pictures. Barton is hired to write a Wrestling picture, and stays at a classical yet decrepit hotel called the Earle. Barton meets his next day neighbor Charlie, an insurance who is as nice and helpful as they come, but Barton about to learn a Hollywood lesson, as the world he knows begins to crumble around him in a storm of murder, dry Whiskey,fire and boxes. I'm not quite sure I can truly convey the utter brilliance of 'Barton Fink', the film is a polarizing satire of the Hollywood machine, the land where talent goes to either A) Perish B) Dilute C) Succeed, The Coens' are basically depicting Hollywood as Hell, '' Between Heaven and Hell There's Always Hollywood!''. We are all aware of how Hollywood works and the reputation of the show business side of every medium, and there have been many great films that depict this, 'Mulholland Drive', 'Sunset Blvd' and '8 1/2' amongst many others, but I'm not sure any film takes such a fearless approach to the topic like Coen's do here. A brilliant element to this film is its mystery, you can literary discuss this for days on end and never have a definitive answer for its meaning, it really reminded me of 'The Shining' which is also a film that demands heavy discussion (it also features a hotel), Its been very well documented that the Coen's are heavily influenced by Stanley Kubrick's work, so this wouldn't be a surprise if it was an intentional nod, and a brilliant one at that. I would really love to post my theories as to its meaning but I really do not want to spoil this film for anyone. As the you expect from a Coen's brothers film, this is masterfully well made. These men are truly genius of the art form and I can not praise their work enough for being so evocative, entertaining and meaningful. The direction is so stunning and really conveys that we are in the hands of very capable people. One of my favorite aspects of a Coen's film, is the cinematography from Roger Deakins who I believe is the best working today, hes work here is exceptional and is so beautifully drab. I mentioned before that the film was alluding to Kubrick, well the scenes that pan throughout the halls of the hotel feel like a direct homage to 'The Shining'. The film is absolutely phenomenal and there is not a weak link among them. John Turturro is incredible in the title role and displays Hollywood angst perfectly. I love John Goodman in damn near any role and this is no exception, hes fantastic, he can be playing the nicest of men or the devil himself and its still hard not to love him. The supporting cast is all great and consists of Coen regular such as Steve Buscemi as the helpful bellhop Chet (Barton can call him if he needs anything!) Tony Shalhoub, Michael Lerner, Judy Davis, Everyone here is just brilliant! As I said before, I cant convey the utter brilliance of 'Barton Fink', its a border line masterpiece that continues to blow my mind.Its so intricately and masterfully executed by the genius Coen brothers and features the unforgettable performances of John Turturro and John Goodman. This is a must witness film, and I cant stress that enough.